BANGI, 26 Nov, 2010 – The Education Faculty has won UKM’s inaugural e-learning award as the most active faculty in utilizing the Interactive Learning and Teaching Management System by its lecturers. It has the highest record in utilising the interactive system in providing lecture notes, tutorials, assignments, forums and others to its students. The award consist of a certificate of Appreciation and a cash prize of RM1,000. 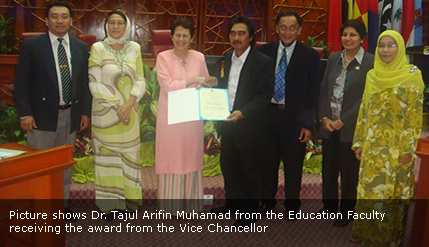 Vice Chancellor Prof Tan Sri Sharifah Hapsah Syed Hasan Shahabudin presented the award last Wednesdday ( 24 Nov 2010) during UKM’s Divisional Heads Meeting. The e-Learning Award was introduced in the first semester of the current 2010- 2011academic year to encourage its academic staff to use the interactive system to teach and communicate with their students and to recognise Faculties and individuals for doing so. The award is divided into 3 categories, Most Active Faculty, Most Active Courses and Most Creative Lecturer. The other two awards will be announced by the Department of Academic Administration later.